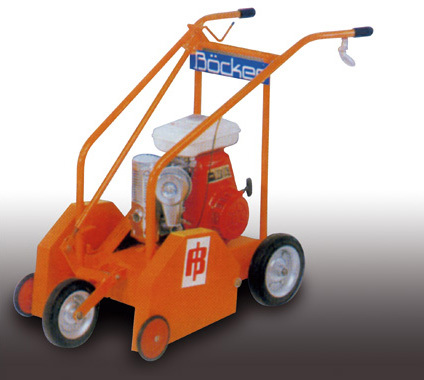 The Bocker Roof Cutter has been designed to cut high performance roof felts during renovation works. The powerful 7.35kw petrol engine drives a pair of TCT blades 525mm apart - one either side of the unit - capable of cutting to a maximum depth of 90mm. The cutting depth of the rotating blades is adjusted by a crank-handle. The blades can simply be lifted clear of the roof by pushing down on the handles, automatically returning the front wheel to the travelling position. Depending on the roof build-up it is possible to cut at speeds of up to 30 metres per minute, which easily exceeds more traditional methods, ensuring labour saving and enhanced safety. Cutting Depth - Max 95mm/4"